Can’t believe it’s already 2014, I feel so old even though this year I will turn just 23. My life changed so much in the past few years so I’m really curious what this year will bring me. Are you curious as well? 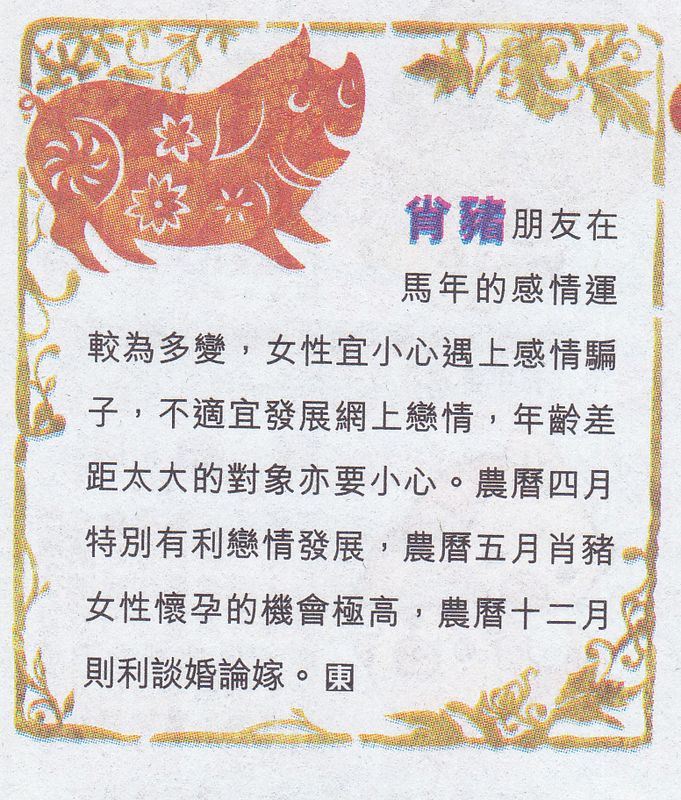 One of the last numbers of Sing Tao Daily (星島日報), which is also published overseas, included a love horoscope for 2014 and I thought it will be fun for you – single, married or in any other kind of relationship – to see what they think your upcoming year will be. It’s even more funny when I read my love life will be awesome but my husband will fight a lot. 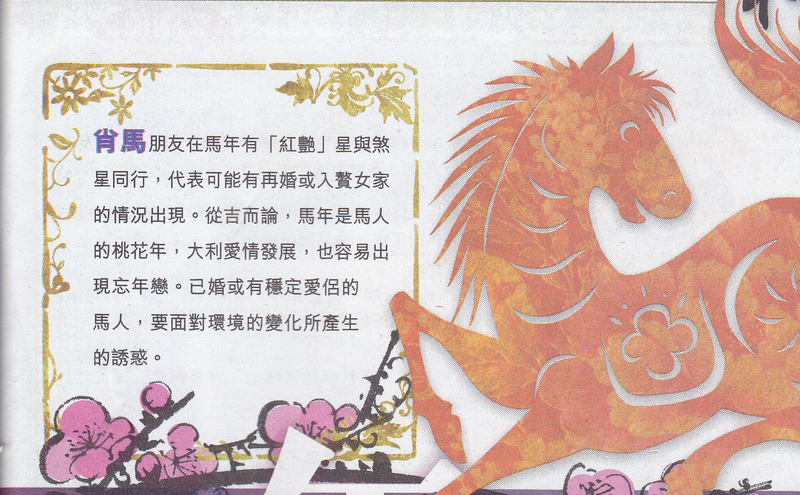 Since this year belongs to wood horse I think it’s good to start with a fortune for all horses. 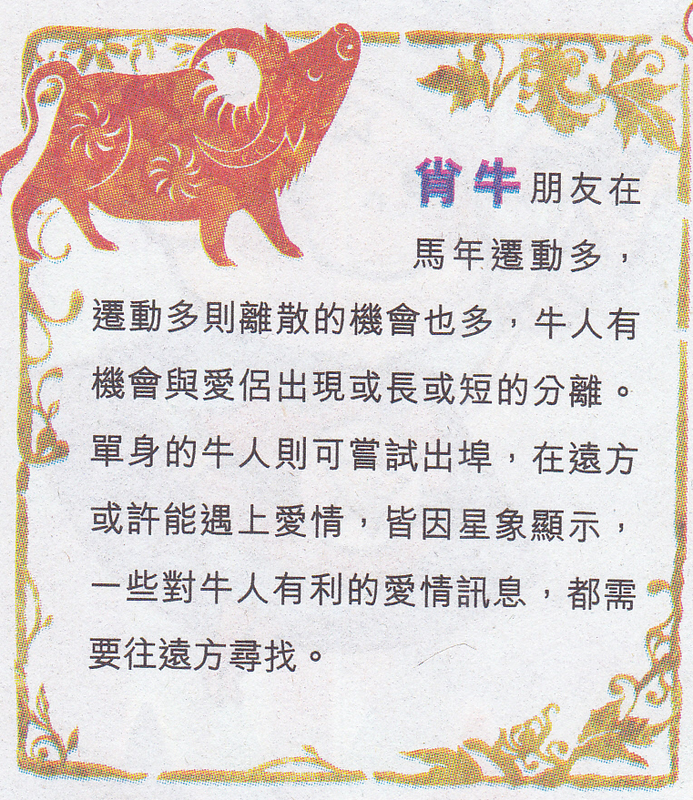 If you’re not sure which sign belongs to you check this article about Chinese zodiac on Wikipedia. 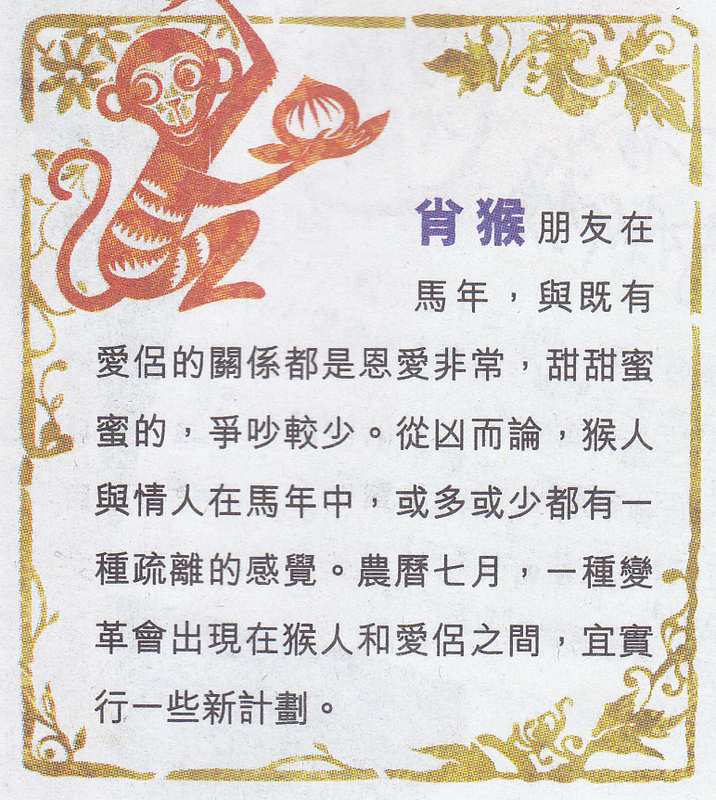 To read original horoscopes click on the pictures. Very good year to get married again or following the girl (take her family name, live with her family etc.). It will be easier to get into a relationship with a big age difference (‘forget-age love’). Married couples or people in relationships should watch out for new temptations around. Your love life will be very successful, easy to find a partner, marry and get pregnant. 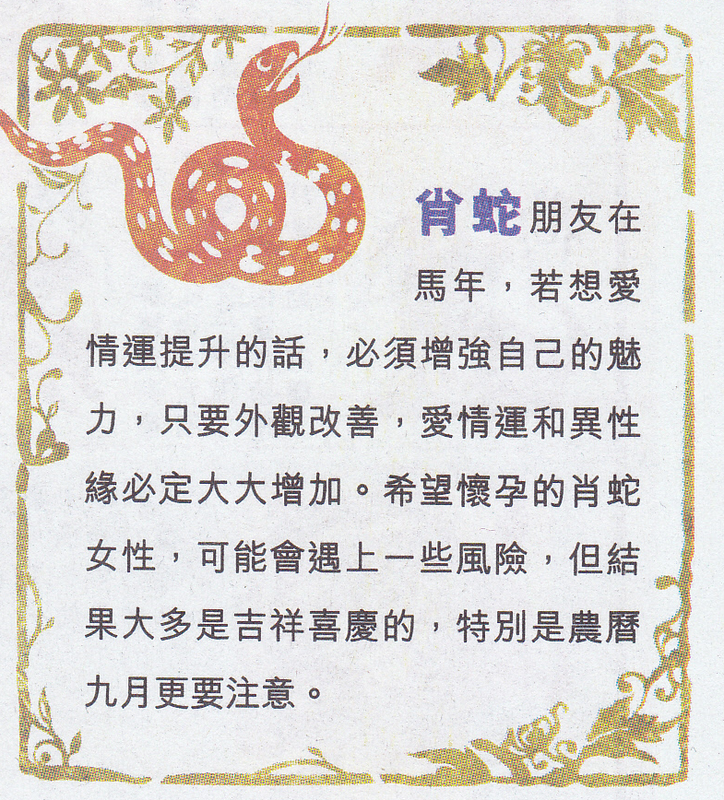 9th lunar month is the best time to improve your relationship. 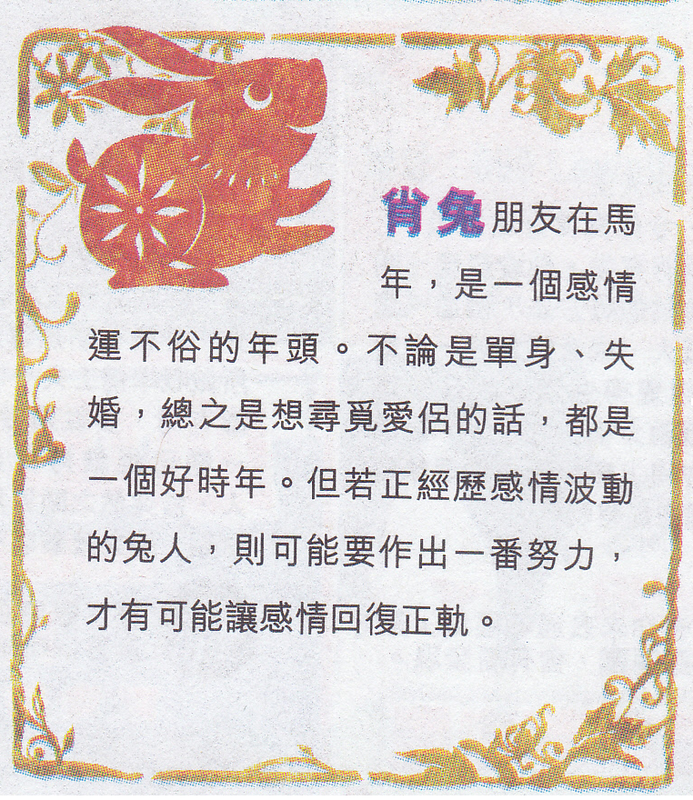 11th lunar month can bring ‘forget-age love‘ or even a married (taken) person who will want to chase you. This year’s relationships will be good but not really close. There’s something hidden between the partners. 7th lunar month a change might happen so be prepared for new plans. Very easy to have a mistress (or lover) coming into your relationship and taking away your partner. You might get involved in a long distance relationship with other province or country. Young Chickens (love the name!) are easy to get pregnant especially with twins, triplets etc. Lots of pressure waiting for Dogs, especially female Dogs. That pressure might not be bad – it might show a direction for change. 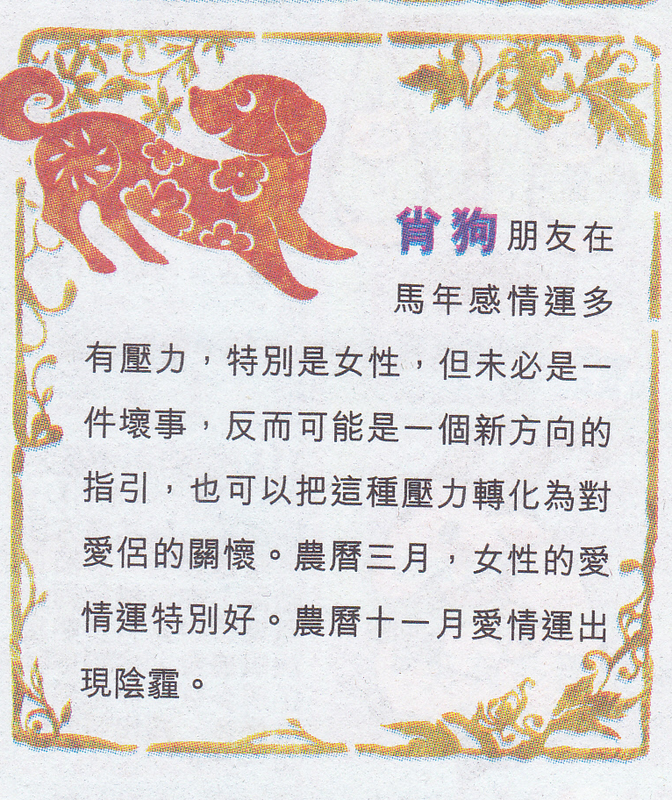 3rd lunar month will be very good for female Dogs’ relationships, 11th month will be the worst one. Year of horse will bring a lot of changes. Females should watch out for scams (trick you for money) – bad for online dating but also a relationship with a big age difference. 4th lunar month is the best to find a relationship, 5th lunar month is the best time to get pregnant and 12th lunar month is perfect for getting married. If you want to have a good luck in relationships, please dress yourself up (geez, who exactly writes it?). This year you have a chance to make a good relationship, no matter if you’re single or divorce. If you marry a Horse you have a chance (for a baby-centaur) to stay together for ever. You have bigger chances to move with your life (to another place or change a job). That makes your chances of long distance relationship higher. Single cows can try to find love in other places than where they live. You and your partner will have easy fights. Even thought you’re together you might feel a bit lonely. Tiger females are easy to get pregnant. Single tigers have big chance of finding a partner online or in another country. If you’re single it’s a good time to get into a relationship. If you’re currently in one you might be in trouble and need to work hard to come back to normal. Love-life won’t be stable, you might lose passion you had before. But don’t worry there’s a lucky star that will come to help re-start the relationship. 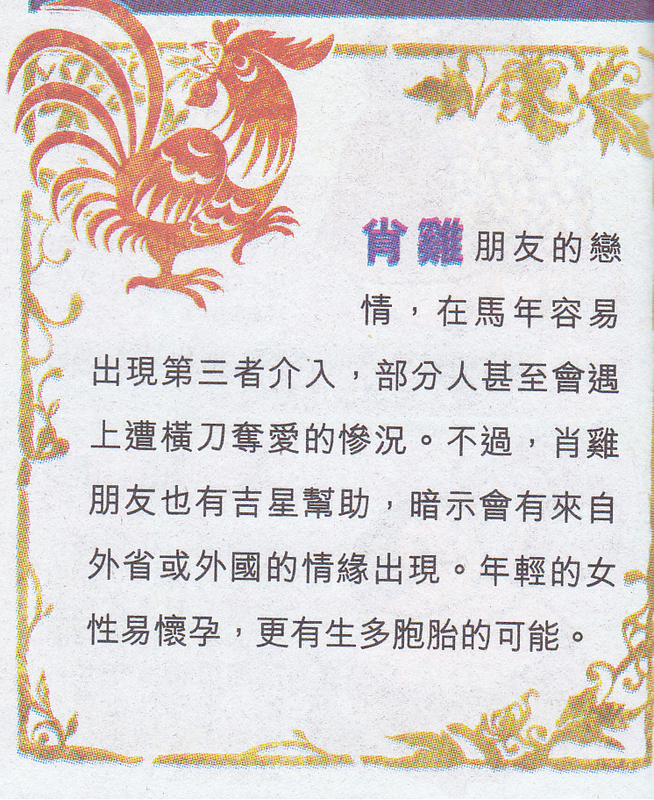 4th lunar month will be a good time to move forward in relationship. Make yourself more presentable and charming. Female snakes who want to have a baby might be at risk. 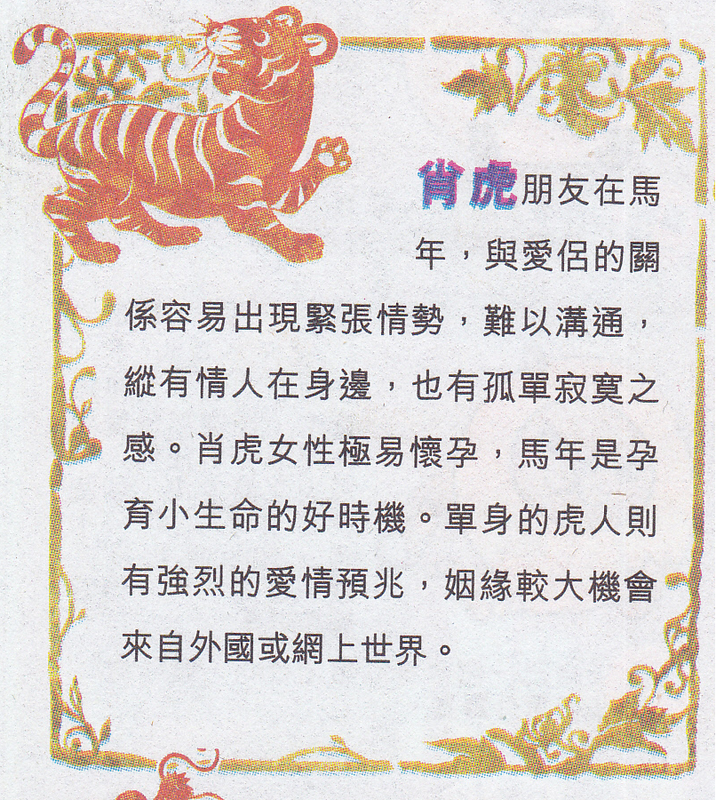 Pay attention to 9th lunar month. 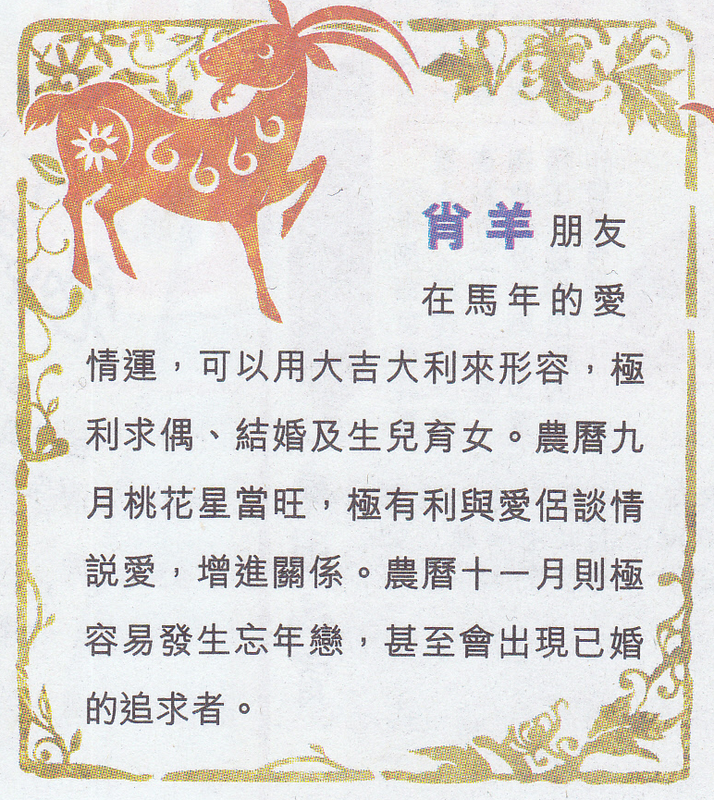 I only believe in them if they are positive, so no, I don’t like mine for the year of the horse (I’m a rabbit), haha. Awesome post. Though I think there is a small mistake for the rat. 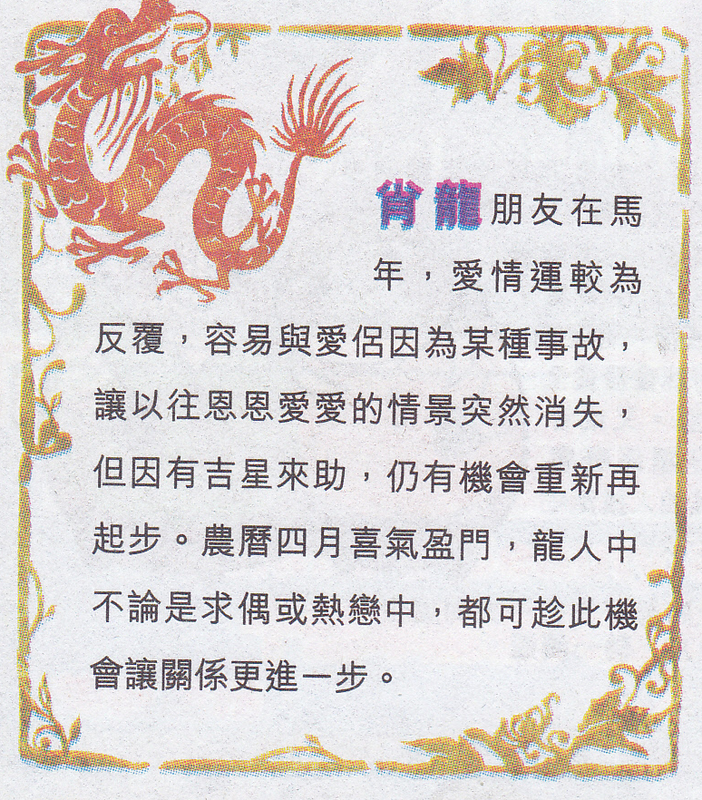 The last line ought to be “if you marry in the year of Horse”, instead of “if you marry a horse”. lol. Thanks for the awesome post anyway! Make sense, my future long distance lover will have a lover on the side. 😉 Knowing that, there’s no sense in getting a relationship. 😉 If young means under 25, no children for me! Yay! Hey its not the horse year yet, but I get it and its on all our minds. Happy new year! I don’t believe in Horoscopes, but I read them every now and then. 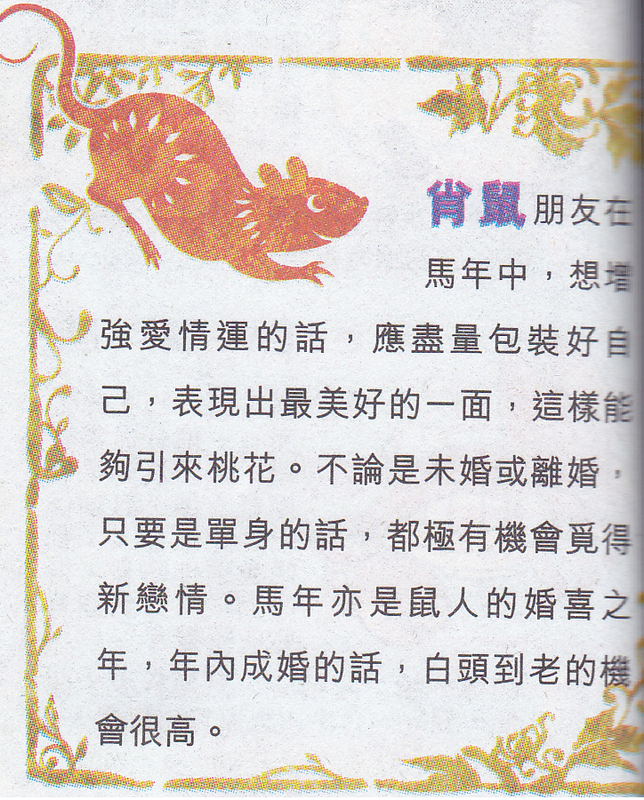 I am the year of the Rat and according to this I have a chance to make a good relationship! I have to dress up though hahaha!! I don’t believe in horoscopes but I find this to be really funny! I wonder why so many of us love to read horoscopes even though we don’t believe in them. As a Horse married to a dragon, this seems like a dangerous year for us. Wow, spot on for me as a rooster! I am embarking soon to live in Spain while my girlfriend lives in France until May/June. Hello myhongkonghusband a lady with the very long name, long names are always something that has made this Cat laugh about humans, we Cats have simple names, mine is Cat, I added the ‘The’ just because it made the cover of my book look more impressive to humans. Other Cats I have known also have simple uncomplicated names, like Claw, Purr, Eow, these names usually reflect some element of the Cat’s character and so I am sure you know why we called ‘Poo’ Poo, but I am digressing. Thanks for liking my little blog, it is just the reason I write it. I read your blog, well it seemed the right thing to do under the circumstances and have one comment which is this. It seems wrong that one of the most successful animals on the planet, and not because we invaded human households thousands of years ago, did as little as possible around the humans house and still got fed because we looked cute, we and I included all my feline cousins here are successful because we are clever, some say too clever for their own good tee hee! Do drop by my blog again, I will do the same, and of course look for news on the Chinese upgrading the names of their years to include The Year of the Cat, if they want my advice they could ‘drop’ the Year of the Goat, dreadful smelly animals who steal children’s ice creams in petting zoos! Haha not sure if I believe in this or not, but it’s still fun! Thanks for the translations! According to this, I’ll be having a kid but losing my lover. What an exciting year it’ll be. I’m a goat (or I prefer to say sheep)…and the fact that it could be easy for me to get pregnant scares me! Looking forward to a year of the cat…….. I wonder why this amazing animal was left out.